$8k and counting! Do you even Monsters Brah? We've awarded over $8000. We'll be over 10k in the next two weeks. If you like playing games and earning at the same time this is a great place for you! It's been a while since we've had a refresh of the collection screen and the market screen! These are some quick features we're slipping into the dev cycle before our in game currency, Dark Energy Crystals, gets into full swing! Be sure to tune in for the news as the screens will get a little prettier and easier to manage! In case you missed it delegation has gone live. You can now trustlessly lend cards to friends and strangers for free, crypto, share of earnings, or whatever your voluntary consent can come up with!!! One thing we're excited about as we're planning DEC is how we can reward every win. It'll work similar to how Steem has a reward pool, but instead of rewarding you based on Steem Power we'll use season rank. Instead of voting giving Steem winning will give you DEC. The crypto community seems to dig their instant gratification. We're excited to provide you a token for all the matches that you win! Be sure to stay tuned in as we develop this out over the next few months! 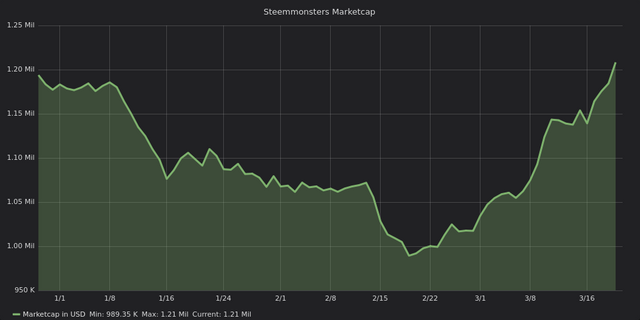 Steem Monsters is pays to play! Come stake some cards, play the season and quests for daily and biweekly rewards, or fight in our tournaments for glory and riches! Or simply get some cards to delegate out for passive income. It's your choice how you want to earn here, but earn you can!!! We're sitting at the high of our 90 day marketcap price! How cool is that! People have gone nutz since we launched tournaments and even nuts-er after we launched delegation! Prince Renn is going for $40! A good card or two in a pack can pay off!!! Hi guys, just wanted to ask about Dark Energy Crystal token that, if I remember correctly, users can get from burning cards. I saw some graphic with info about it, is it still planned? Yep, Dark Energy will be released in teh coming months. You'll be able to nuke cards and squeeze some dec out of them. We're not doing away with the Steem tournaments mind you. We'll still pay those, this is for daily matches! Steemmonsters are here! Full of surprises and god fortunes 🔮! Play more and earn more! Will there be any market place for card delegation? If it comes, when will it come?